The soft, sticky dumpling plunged into the pot of fiercely boiling water. I heard a dull plop. A small splash. I dropped another. And a third. Then I waited. I waited with bated breath. I waited for the dumplings to rise to the top, which meant they were done. In Filipino, litaw [lee-tou] means to rise. To emerge. To appear. To be seen again. Palitaw [pah-lee-tou] is a sweet rice dumpling that does precisely that — it rises to the surface once it is cooked. Palitaw is made from galapong [gah-lah-pong], which is the dough made from sticky rice that is soaked in water overnight and then milled in a traditional, heavy stone grinder called gilingan. It is the same sticky rice dough used to make bibingka and bilo-bilo for ginataan. The home cook’s version of galapong is made simply by combining glutinous rice flour and water and then kneading it until it becomes a smooth dough. Palitaw is another popular kakanin or Filipino rice treat that one can find in public markets and churchyards back home. These chewy dumplings are sometimes wrapped in plastic in flimsy foam trays or neatly arranged in wide, shallow bamboo baskets lined with banana leaves next to other native rice cakes like suman, biko, puto and kutsinta. It took a couple of minutes for the dumplings to float to the top. Minutes that seemed impossibly long. The playful bubbles made the dumplings tumble up and down. With my wire mesh skimmer, I gingerly fished them one by one. I let them drain for a moment and then rolled them quickly in grated coconut. I lavished each one with sugar and the fragrant sesame seeds I had just toasted in my iron skillet. I picked up a piece with my fingers and took a bite. 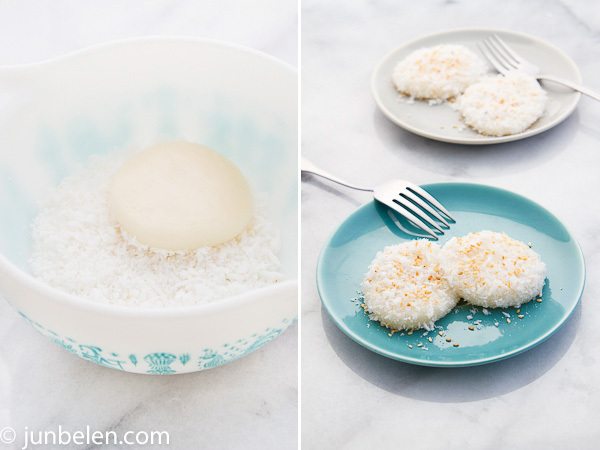 Soft, chewy dumplings with the delightful texture of coconut and the rich nutty flavor of toasted sesame seeds. I licked my fingers clean of the sugary grit and reached out for another. Truly one-of-a-kind. Truly tastes like home. Knead the rice flour and water in a mixing bowl to make a smooth dough that holds together and separates cleanly from the bowl. With floured hands, pinch off about 1-1/2 tablespoons of the dough, roll into a ball and flatten into a patty, about 2 to 3 inches in diameter and about 1/4 inch thick. Set aside on a dry plate. Repeat with the rest of the dough. Place grated coconut in a bowl. Mix sugar and toasted sesame seeds in a separate bowl. Bring 2 quarts of water to a boil in a pot. Drop the dumplings into the pot and boil until they rise and float to the top, about 1 to 3 minutes. Scoop them out with a wire mesh skimmer and drain. 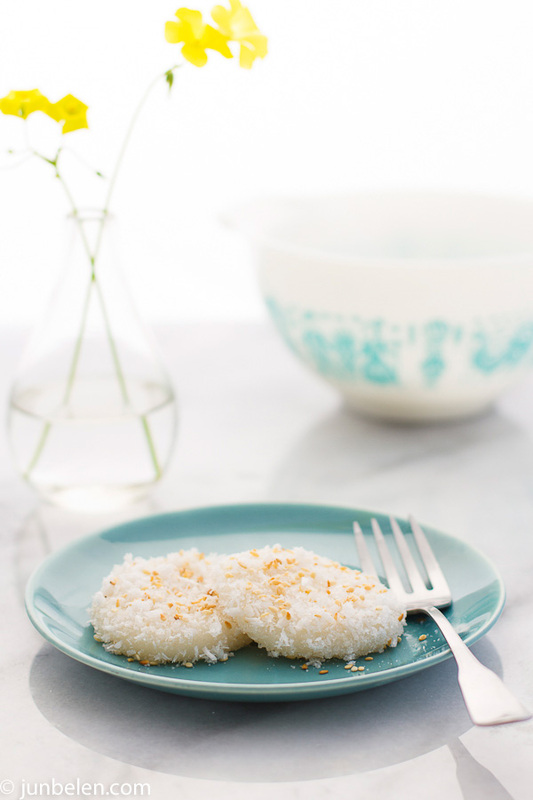 Roll the dumplings in coconut and then sprinkle generously with sugar and toasted sesame seeds. 1. When using frozen grated coconut, thaw it completely and drain the excess water either by pressing with your hands or using a fine mesh strainer. Spread coconut over a baking pan and lightly toast it at 350 degrees F for about five minutes. 2. How to toast sesame seeds. 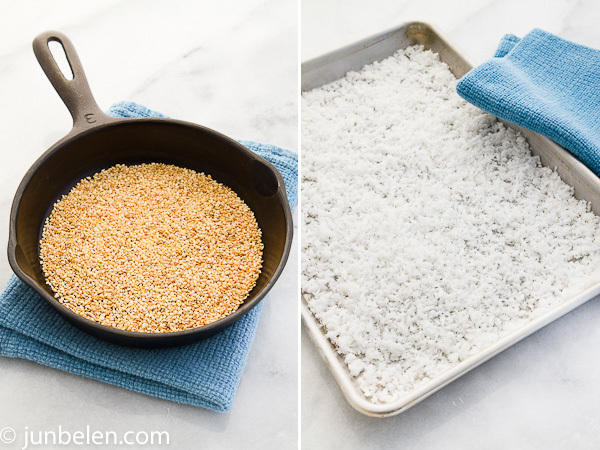 Place sesame seeds on a small pan or skillet that is dry and oil-free. Shake the pan so seeds evenly spread to a thin layer. Toast the seeds over medium heat, shaking the pan or stirring the seeds with a wooden spoon often. 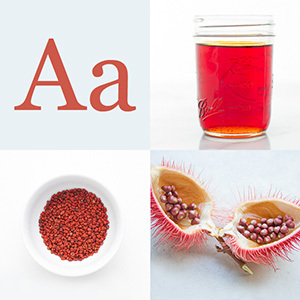 Toast until seeds are fragrant and they turn light caramel in color, about a few minutes. Immediately place the toasted seeds to a plate and let them cool. Do not leave them in the hot skillet where they will burn. 3. Drop one to three dumplings at a time so that they do not stick with each other and crowd the pot. I Never realized how easy this was to make!! Holy Cow. Thanks for the lesson and for helping to take the mystery out of this yummy dessert. Now I can make it for my Aunt to pay her back for all the batches she made for us! She’ll be so impressed!! Have a great day Jun! Ooh! They’re beautiful. I love that yellow flower in the photos. It’s a lovely color accent – nicely done! I bet these taste fantastic. Hi Jun. I’ve been wanting to make this so much because I loved this when I was a kid. I have glutinous rice from the Philippines that someone gave me. if I grind the rice to an almost powdery consistency, would that be considered as rice flour already? I did it once with puto and it came out badly. Any suggestions? Thanks! Hey Weng, soak the sweet rice in water first before you grind it. I’d soak it overnight then drain and grind it in a food processor the following day. Grind the rice until it’s fine — paste-like. Then I would wrap it in cheesecloth and hang it so the excess water drips off. Then you can use that as your dough for puto, palitaw or bilo-bilo. Yay! Palitaw is one of my favorite kakanin to eat and to make, great pictures. And what a coincidence as I decided to get my kakanin on for a potluck tomorrow and have some sweet rice soaking. I’ve usually gone the rice flour route but ran out, and am at least 40 miles from the closest store selling it. So we’ll see how the galapong works out…! That info helps a lot! Thanks Jun! Maybe I can do another round of puto and try your palitaw recipe. Thanks again! I don’t like kakanin so much but I make an exception for palitaw ang biko. Your pictures look so masarap! Gonna make this now! good thing I have all the ingredients in my pantry. Thanks for sharing.. love your blog and your pictures! Thank you, Corinne. Let me know how it goes! Palitaw and biko definitely rank high on my list of kakanin, too. Love the toasted sesame and grated coconut combo in palitaw. And for biko, love the texture and flavor latik adds to the rice cake. Thank you, Diana for the note! Haha, I’m so happy that this is posted here. My parents never knew how to make this, so growing up, we just bought it from the local Filipino place!!! I’m gonna try this out soon. THANK YOU!!! Thank you for writing, Abby. You’ll be surprised at how easy it is to make palitaw. Enjoy and let me know how it goes. okay…… i want to make one now. oh wait, not one…..alottttttttt! wow it looks so easy, i’ll definitely give it a try..thanks for sharing Jun..
Hannah, thank you for writing. I think you scooped them out of the water too soon. The dough was not cooked through that’s why the center stayed hard. I’d try one piece and judge how much time it needs to have it cooked all the way through. I hope this helps. The recipe makes 16 to 20 dumplings and I’d say two to three dumplings per person. They are pretty filling. With a cup of coffee, it’s a good merienda or dessert after meals.